Make your way back into the terminal building to check into your scheduled flight to Victoria Falls. On arrival at Victoria Falls airport, look out for our representative. They will be holding a name-board with your surname on it, and they will transfer you to your hotel. Victoria Falls is a dramatic scenic contrast and a change of pace from the private game reserves. The clouds of spray generated by this thunderous wall of water have resulted in a lush rain forest full of stunning wild flowers. A host of activities are centered on three separate aspects: the falls, the magnificent Zambezi River and the surrounding Zambezi National Park. For an overview of the falls, the helicopter flight is worth it. For a more thrilling fly-over, try the microlight flight above the falls and river. And, for the truly daring, bungee jumping is possible. The Zambezi River has two personalities – the wide gentle river above the falls is the perfect place for languorous sunset boat cruises or gentle canoeing, while the river below the great falls offers whitewater rafting and jet boating. Game drives and horse riding are offered in the Zambezi National Park to view elephant and buffalo. Visitors can also sample elephant back safaris and take part in their grooming and feeding activities at the Elephant Camp. The Victoria Falls Hotel, known as the 'grand old lady of the falls' has the best location in town. It lies in the Victoria Falls National Park, a world heritage site, and is the closest hotel to the Victoria Falls on the Zimbabwe side. This venerable five star hotel, built in 1904 has now been completely refurbished and combines the charm of the old with the luxury of the new. Soak up the elegant Edwardian ambience as you sip cocktails on the terrace, which has a spectacular view of the 'smoke that thunders'. The hotel is set in lush tropical gardens, where short walk brings you to the Victoria Falls. The hotel has a choice of dining options. The opulent Livingstone Room offers fine dining, and even a live band. The Jungle Junction is more relaxed and is justly famous for its extensive breakfast and dinner buffets with ethnic entertainment in the evenings. But perhaps the most famous is Stanley's Terrace, the rendezvous for African adventurers for over a century, which still provides the perfect setting for afternoon tea or cocktails later on whilst also drinking in the view of the Victoria Falls Bridge. Other facilities include reading in the Bulawayo room or library, relaxing by the pool or playing tennis on the two floodlit courts. A spa offers a range of treatments including an early alfresco massage. Golfers can enjoy 18 holes on the championship course of the nearby sister hotel, the Elephant Hills Resort, also on the Zimbabwe side of the falls. Today you have a transfer from your hotel across the border to Chobe in Botswana and on to Ngoma Safari Lodge. The transfer takes approximately 1½-2 hours, depending on the border crossing formalities. 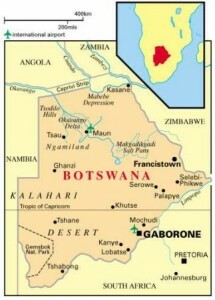 Botswana is one of Africa's last pristine lands and offers visitors awesome scenery and prolific big game in equal measure. An enlightened program of conservation in this stable country has meant that vast areas, one sixth of the country, remain a sanctuary for magnificent herds of game. Chobe National Park lies in the northeast of Botswana, teeming with animals, in particular with huge herds of elephant and buffalo. Chobe's animal migrations follow an ancient pattern, still only partly understood; however, generally, the game is drawn to the Chobe River during the dry winter season and spreads out to the open grasslands of the Savute marsh and pans during the wetter summer months. The Chobe/Linyanti river system is known for some of the best elephant viewing in Africa in the winter months (May to October), with huge herds of up to 500 or more at the end of the dry season. Lion are common, and almost expected, with buffalo, cheetah and an amazing variety of antelope often sighted. The river is alive with crocodile and hippo and amazing birdlife, including kingfishers and bee-eaters. Languorous sunset cruises are a specialty of the area. You are transferred to Kasane Airport where you are met and transferred by light charter flight (seat in plane) from Kasane Airport to your game lodge in the Selinda Reserve. Selinda Camp is a small luxury tented camp on the banks of the eastern Selinda Spillway, a waterway that links Botswana's Okavango Delta to the Linyanti and Kwando marshes, rivers and floodplains. The shaded camp is slightly raised with glorious views over the Selinda floodplains and wide open savanna broken by attractive palm trees. It is these views, from your private decks and the main lodge, that are one of Selinda's most compelling features. Each of the nine spacious tents under thatch has two comfortable twin beds and fine linen. Luxurious, flowing mosquito nets add to the romantic atmosphere of the rooms and ceiling fans cool your living space when needed. Outside, a large private verandah offers game-viewing from the comfort of your own tent. There are spacious, en suite bathrooms, with full sized stone baths and antique showers. Sliding doors allow for privacy or create for an open-air bathroom. The main living area is under cool thatch with a spacious lounge and dining area as well as a raised outdoor dining deck for evening meals under the stars. Evenings end around the campfire, a tradition that takes you back to the stories of the day's safari, shared philosophies, laughter and African folklore. Above the wine cellar is a quiet reading area where you can enjoy the fine art selection of Beverly Joubert's images collected over the years from her work with National Geographic. Under shade, the camp's plunge pool is surrounded by lush grass and is tucked away from the main area for privacy. Experience a unique once-in-a-lifetime photographic safari with David Murray, National Geographic and Wild Studio. These photographic workshops are available on select dates during the months of October and November at Selinda Camp. (Please note that other dates can be arranged on request). David Murray, a professional photographer and specialist in wildlife photography of the region, hosts the workshops, which provide a flexible itinerary covering a diverse range of photographic techniques. A program to be tailored around all abilities, from professionals to families, and can include smartphone photography. Each of the participating camps have their own studio fitted out with every photographer’s needs. This will include charging stations and lockable areas to store your equipment as well as computers available for editing and regular image reviews hosted by the photographic specialist. The final product of the workshop will be to take home a fully edited portfolio ready for publishing. Each of our participating photographers will then have their images placed on a Wild Studio library to allow them to be shared. All vehicles have been modified to provide camera supports and beanbags. Beanbags provide the most universal solution for the majority of our photographers but we can tailor the vehicles around anyone’s requirements including gimbal supports by using additional clamps. You will participate in a unique project that uses cutting edge technology for animal conservation. Great Plains Conservation is working with the University of Surrey, UK, on a groundbreaking wildlife monitoring facial recognition project. All photographers will be able to participate in this by gathering data while out in the field. The technology has previously been used successfully on tigers in India and the result was published in National Geographic magazine. This is the first time this has been attempted to include travelers in Africa. The concept is simple. You are supplied a camera with GPS capability to use, and then the images are collected and send for scanning. The software can recognize the individual species, principally the big cats, and a movement map using the GPS data embedded in the image is created. You are collected from Franschhoek and transferred to Cape Town for a half-day tour of the city. Cape Town is one of the most beautifully situated cities in the world. Cradled by Table Mountain, it has immense charm and historical interest while its unique cultural blend; part African, part European and part Asian, makes for a cosmopolitan dining experience. Begin with a visit to Table Mountain. Take the cable car for a panoramic view of the whole of the Cape Peninsula. There is time for a short walk at the summit to admire the incredible scenery. Note that the cable car tickets are paid by you directly as the ascent is weather dependent. Then, travel into the city where you first see the Castle of Good Hope, the original fort of Cape Town built in 1652 and now painstakingly restored. From there you continue to the historic center of Cape Town with its many 18th-century buildings where there is time to visit two of Cape Town's museums. You may like to enjoy a stroll through the Company Gardens past the Parliament buildings. Finally, you explore the picturesque Malay quarter, a historic sector of the city with original Malay buildings and narrow streets. Return to your hotel with the remainder of the day is at leisure. You may want to meander through the wonderful Kirstenbosch Botanical Gardens. Browse through the vibrant Greenmarket Square, take a boat trip to Robben Island or simply relax on the beach. When you want to range further, the Cape Peninsula offers one of the finest coastal drives in Africa to the Cape of Good Hope. Here you might see whales breeching just off the bay or quirky African penguins on Boulder's beach. The trendy Atlantic Ocean villages of Camps Bay, Clifton and Bantry Bay bring out the Mediterranean aspect of the city. Spectacular views of the Ocean, dramatic crimson sunsets, palm trees swaying against white sandy beaches and alfresco pavement dining are very much the norm, and yet you're only a ten-minute drive from the city. The southern suburbs of Newlands and Constantia reflect yet another side of Cape Town, reminiscent of its gracious colonial past. Majestic oak trees and endless swathes of roses and blue agapanthus are set against the forested slopes of Table Mountain. Here you can enjoy gentle woodland strolls. Cape Town is fifteen minutes away by car and beaches are only ten minutes away. Land price, per person, double occupancy: From US$1,200 per person per day. Internal air (Johannesburg-Victoria Falls & Maun-Cape Town) additional.